December might have been mild, and these past days (for January) have been glorious. But I’m no fool. The worst is yet to come. 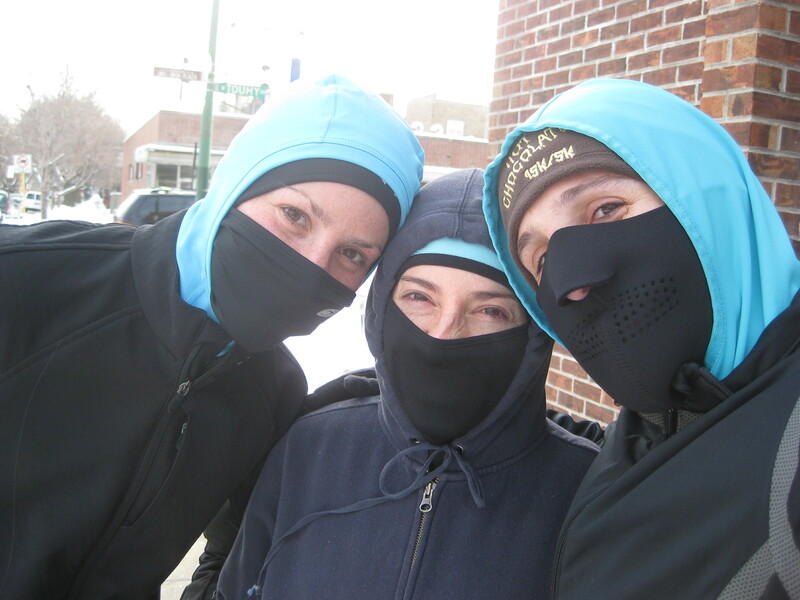 I’m a year-round outdoor runner–even in Chicago. Running outside takes a lot less time than driving to the track and back, and it’s a lot more interesting. Spending time outside also makes winter seem more manageable. 1. WICKING BOTTOM LAYERS: I have a couple of great “Cold Gear” shirts from Under Armour. Pricey, but worth every penny. There’s nothing worse than feeling wet in the cold. If it’s really terrible out, I’ll wear a loose-fitting wicking shirt or even a fleece vest over the base layer. 2. WICKING JACKET WITH A DRAWSTRING HOOD: A hooded sweatshirt will do in a pinch, but what’s nice about a wicking jacket is it repels rain and snow on the outside. The hood also blocks the wind from my head and ears, which makes a huge difference. 3. GLOVES, WICKING HAT & FACE MASK: Here’s where I start to look like a bank robber or ninja. Any wicking running hat will do, but these gloves, with mitten coverings really make a difference. And the face mask is absolutely essential. 4. DOUBLE SOCKS: Under my pants, I wear a pair of knee socks and then cover them with a pair of running socks. 5. REFLECTIVE VEST: Totally dorky, but if it’s dark in the early morning or snowy, I’ll wear my husband’s biking vest and totally embarrass my running partners. As for my route, I avoid large open spaces on windy days and try to run perpendicular to the wind, if it’s really strong. Kedzie is good in the winter because the Winston Towers janitors plow the sidewalks right away. It’s also one of the first streets plowed and has four lanes, with only two for traffic. I always run against traffic if I have to go in the street. The McCormick path from Touhy to Devon is always plowed too. I’ve been known to even follow the snow plow. If you see me, you might consider me a fool. But I’ll be a happy one. And I won’t have cabin fever.